Following the previously released information for Shin Megami Tensei IV Final in separate posts, dijeh on Tumblr has translated the full 10-page feature for the game, from the Weekly Famitsu issue released on October 8, 2015. The feature contains information from the game, as well as a developer interview with the producer Kazuyuki Yamai. The scans from the Famitsu article the translation is based on can be found in this previous post. A Deity* who encounters the dead protagonist in the Land of the Dead**. In exchange for bringing the protagonist back to life, he proposes they make a contract in which the latter will become his ‘god slayer’***. What are his true intentions though…? **More exactly, Yomi no kuni, the land where Izanami remained after her death. Different from SMT II’s Underworld and the Expanse. A Deity who creates and leads an alliance of polytheistic gods. Says he wants to save mankind and intends to manipulate everyone, but his real objective remains unclear. A seraph (the highest category of angels) resulted from the fusion of the four archangels in order to resist Lucifer. As God’s chariot, Merkabah rejects impurities and wishes for a world of order ruled by the gods. The youngest of the three Gorgon sisters of Greek mythology. She was defeated by a certain someone, but is revived as one of the members* of the polytheistic gods. A mermaid who lures mariners with her beautiful singing voice. She appears before the protagonist’s group as reinforcement from the polytheistic gods. The King of demons who used to be a seraph but whose disobedience to God relegated him to a fallen angel. He refuses God’s order, leads the demons and aims for a world that can only be changed by strong beings. In life he used to be an 18-year old Samurai of the Kingdom of Eastern Mikado. Now a ghost. Lost his life stupidly, couldn’t rest in peace, but encounters the protagonist who can sense him and immediately possesses* him. He is selfish, full of himself and arrogant, but meeting all kinds of people makes him start changing. The protagonist’s 15-year old childhood friend who is also an apprentice of the Hunter Association. A girl who always looks forward and does her best when it comes to everything, including her wish to become an excellent Hunter like her father. She travels together with the protagonist, but sometimes their adventures make her fully aware of and worried about her powerlessness. Dagda: So…what’re you going to do, brat? If you want to sign the contract, give me your name. Krishna: As they are now, humans keep making the same mistakes. They should be saved by us. Navarre: Right I am your master*…so to speak! Yes, your master! Dagda: Don’t listen to that, my god slayer… Joining your forces with others is too much. Lucifer: Will you not lend me your hand so that YHVH will never be able to stand again? Merkabah: The ones who believe can be saved. Help is always close to you. 203x, Tokyo. While trying to escape the destruction caused by the sudden ‘war of the gods’, Japan’s former capital city was covered with a thick stratum of rock. Contact with the outside world ceased. The war ended and Tokyo endured, but there, where no ray of sun can creep in, people kill each other over goods and the angels and demons standing at the top of the food chain overwhelmed and are now controlling the remainder of humanity. The isolated Tokyo, with no place to escape to, is now a true demon city. The game’s protagonist, a fifteen-year old boy born and raised in Tokyo who spends his days as an apprentice at the Hunter Association, is attacked by a demon during a mission. Thus, the lid is pulled over the coffin of his short life. While wandering in Yomi after his death, the protagonist encounters a mysterious demon who calls himself the Deity Dagda. ‘If you make a contract with me, I’ll send you back to your world’. The boy reluctantly accepts, but Dagda has ulterior motives. ‘Starting today, you are my god slayer. We’ll kill all the gods together.’ Besides a new life, the demon gives the boy the ability to summon demons and make them his allies. The boy returns to the demon city, Tokyo, with only enough power to survive battles, while Dagda enters the boy’s smartphone and starts observing him… At that time, the final war between the four archangels under the form of Merkabah and the demon king Lucifer is approaching its final stage. That is when an organisation of polytheistic gods known as the ‘Polytheistic Alliance’ descends among them, led by the Deity Krishna. Stating that his objective is to save humanity, Krishna demands that humans offer him their souls. Is killing gods the path to choose? ‘Humans are our property. You think I’m going to give them over to the Polytheistic Alliance or anyone else?’. Merkabah and Lucifer reject Krishna’s demand. Just as the final battle is supposed to end, a new war breaks out between the monotheistic gods and demons and the polytheistic gods. The situation gets worse. At the same time, the protagonist travels together with Dadga, meets boys and girls his age, they fight and grow together, suppress one by one the demons and angels who are trying to use humans and put an end to their plans. The boy himself is also coming close to a decision. Should he kill all the gods as Dadga’s ‘god slayer’? Or perhaps he should choose another path? What is the ‘fate of the world’ brought about by the boy’s chosen path and decisions? Continuing from Shin Megami Tensei IV, the character designs are once more Doi Masayuki’s responsibility. There are obviously brand new demon designs, as well as a few demons from the previous game, all refined by Doi Masayuki. We recommend Merkabah, Lucifer, Krishna, as well as the angels and demons who work together with the polytheistic faction. The comrades you choose as your partners will be a great help in battle! The game allows you to choose a ‘partner’ from among your comrades who will assist you with various skills. Asahi is primarily the healing type, Navarre uses attack items and support spells, assisting the protagonist each turn. The partner grows at the same time as the protagonist; Asahi, for example, can learn to cure status effects. During battle, the actions of your partners can give you extra turns and the group members who aren’t taking part in the battle can intervene and conduct an ‘assist attack’. This attack cancels the enemy’s actions, displays your comrades’ skills one by one and affirms its position as a fierce trump card when the entire party starts leading consecutive attacks. Grasp victory even when you encounter powerful enemies! First, I would like to ask you about the details of the development behind SMT4F. Yamai: After the release of SMT 4 there were several voices in our company asking whether we could release a ‘Maniax’ version as well, but after serious consideration, our ideas kept expanding and we ended up starting development on an unexpected new game. While there were various things going on with SMT 4, it was a game where we did everything we could, but there had been for some time feedback suggesting that a different approach to its world would be interesting, so we decided we’d make everything clear using this opportunity. This also lead to the title: FINAL. 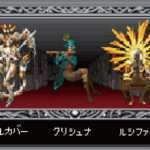 SMT4F features the war between monotheism and polytheism, a new spin on the story. Yamai: From the very beginning, Shin Megami Tensei has constantly presented a dark story and world view which deeply entwined human drama with the gods and demons often depicted in RPGs as allies or enemies, with both sides using or toying with each other. This is something I learnt from Kaneko as well, but I also want to pay attention to in this game: this is Megaten, where you can taste the feeling of falling from grace and the complications it causes in the lives of humans. Moreover, touching on the subject of the relationships between gods, demons and humans in SMT4F…actually no, let me tell you first why demons and gods are concerned with humans in the first place, since that’s an interpretation of the game’s basis. This sounds like a story that touches the spirit of Megaten. Please go on. Yamai: This is just an interpretation, but humans make gods and teachings about them the norm in their lives, so when something bad happens it’s considered the doing of some demon; to keep their hearts at peace in this tough world, they need facets like gods and demons. This will slide into epistemology, but gods and demons exist for people who believe in them and don’t for those who don’t believe, and if you stop believing, they, the target of your faith, disappear. Following the point of view that people’s belief is the proof of the existence and strength of gods and demons, we can see a sort of symbiotic relationship. However, as human civilisation develops, people end up wanting to live without being bound to anything, but on the other hand there’s also the fragile future which makes us wonder whether humans can actually live independently… These complications form the basis of SMT4F. In order to portray a good grasp of the conflict between monotheism and polytheism, the opposition between humans and the gods who have a close relationship to them, we aimed to construct the story starting with the human drama which will become the foundation. Speaking of human drama, SMT 4 also focused on the Hunter Association. Yamai: That’s right. The Hunter Association is needed by the people of sealed Tokyo left in a critical situation under the dominance of demons and I’d say its members are more part of the infrastructure than actual heroes. 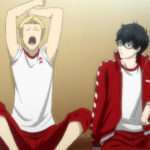 The protagonist who belongs to this group is a fifteen-year-old boy, neither a child nor an adult. This way, we made it easy for the players to sympathise with him, to put themselves in his place and make decisions based on their own feelings. Compared to the Tokyo we’re living in, the protagonist’s death in his own Tokyo shows what a cheap thing life has become: just one common tragedy among others; Dagda, however, has his own plans and grants him a new life and superhuman powers, making the wheels of fate take a huge turn once more. We can see from the expression of the protagonist featured on this number’s cover that he has become something different from a human and I’d be really glad if people saw in him the same rebellious spirit that characterises Megaten. SMT4F has been praised as having an ‘awesome story’, what can you say about that? Yamai: There are two big points regarding this. First, it shows people in critical situations, including a much necessary realism. Second, there’s a certain area that is either unexplored or written ambiguously, fantasy style, in the majority of RPGs – together with the story’s theme, the point of strongly stepping into into the players’ comfort zone. At the risk of being misunderstood, we included the theme of ‘bonds or killing everyone?’. ‘Killing everyone’ might sound extreme, but considering the wealth of ideologies present nowadays there is also the course of aiming for bonds where one considers whether these relationships should be important and whether they can empathise with others or not. If the player feels that direction is wrong, if he becomes a bad guy for example, maybe he thinks he needs something to guide him to the right path… Perhaps this kind of complicated feelings will sometimes be transmitted in this game through the contact of gods and demons with humans. It’s not like the game tells you what is right and what is wrong, but I really hope that after finishing SMT4F the players will remain with a sense of values they themselves have discovered through the various events and encounters of the game. I think that is Megaten’s true worth. Please tell us something about the protagonist’s comrades. 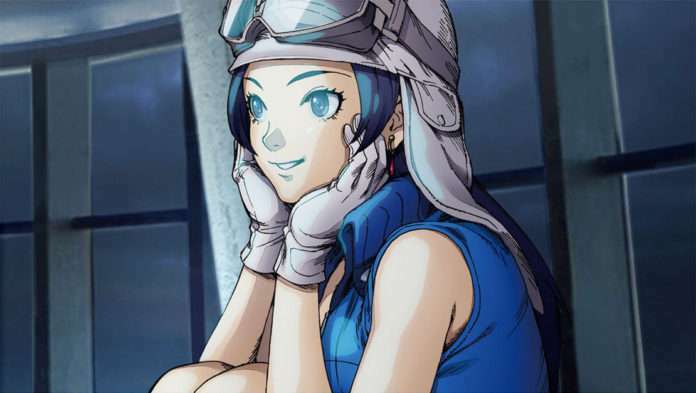 Yamai: If I had to say, SMT 4’s protagonist acted alone a lot, he was a highly individualistic hero. 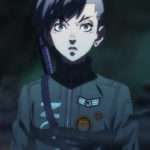 In SMT4F, there are comrades who will move together with the protagonist, starting with his childhood friend Asahi, and besides the gods who want to impose their own will, there will also be conflicts with one’s allies and sometimes the journey will advance even when arguments arise. The partner system too gives off a real feeling of fighting together, and the feelings of each partner – moving with the help of AI, show them as actual, life-sized characters. Asahi, for example, is an honest girl, the heroine type, something that hasn’t been in Megaten lately. I was charmed by Seike Tomoko’s acting skills, so I decided to invite her to play Asahi. She gave her all when showing Asahi’s growth in the middle of critical situations. Navarre makes an unexpected reappearance. Yamai: In contrast with the main group of SMT 4, which had been chosen by destiny, we can say that Navarre was a failure, someone who never managed to do his best. To top it off, he also lost his life and seeing now, after becoming a ghost, children who are younger than him facing trouble and being toyed with by reality affects him, consciously or not. Even we wanted to bring him back into action once more, and prepared his comeback. Players should expect the drama surrounding his appearances to become more intense. I am deeply concerned about the battle system and the characters appearing on pages 14-15…! Yamai: You will have to pay attention to future news for that. I am really grateful to the staff for the passion they have put in this project, which has lead to a palpable high quality. We have also listened to many of the opinions expressed by fans who played SMT 4 and have added even more improvements to this game, revamping every key input and demon conversation. We are aiming to make the number one game for the Nintendo 3DS, so we were particular about every tiny detail. This is a completely new game which can be enjoyed even if you haven’t finished SMT 4, so please look forward to it! P.S. The photo was taken last year at the Kishimojin Temple, where Kozuka Yamai, Hiraoka Naoto (consumer software chief) and Doi prayed for the completion of SMT4F.